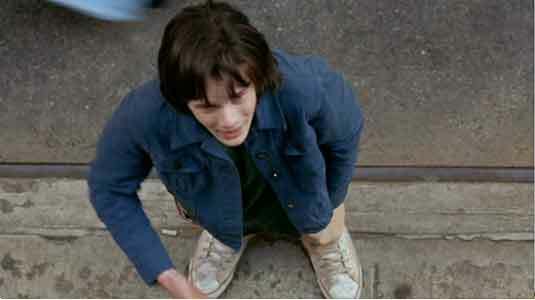 Anton Yelchin wears optical white high top Converse “Chuck Taylor” All Stars in the film. Tom begins to tell his wife Coralie the truth about his past. Tom Warshaw (David Duchovny) is an American artist living in Paris with his French wife Coralie (Magali Amadei) and son Odell (Harold Cartier). As the House of D opens, Tom has made a decision in his life to finally tell his wife and son about his past life in Greenwich Village in New York. It is Odell’s thirteenth birthday, and Tom was supposed to meet him hours ago and go for a bike ride with him. Instead Tom shows up six hours late and it is dark outside. Odell is asleep on a bench outside their flat and gets into an argument with Coralie about his irresponsibility which wakes up the neighbors. But Tom is adamant that he wants to tell the story of how his life was changed on his thirteenth birthday. Soon Coralie and the neighbors are transfixed by the strange set of circumstances which led to Tom becoming an expatriate artist in Paris. Tommy lives with his mother, who is very unstable after the death of her husband and Tommy’s father. The film then flashes back to Greenwich Village in 1973. We meet Tommy (Anton Yelchin) at age thirteen, who is living with his recently widowed mother (Téa Leoni) and attending a prestigious Catholic Prep School on a scholarship. Tommy is one of the school’s brightest students, and is especially good at getting his young French teacher (Claire Lautier) to unknowingly say sexually explicit words in English. Tommy’s best friend is not a kid his own age but Pappass (Robin Williams), the 41-year-old assistant janitor at his school, who is mentally challenged by today’s terminology, but back in the 1970s was described as mentally retarded. Pappass is not so much mentally retarded (he actually is pretty sharp at times) but emotionally could never develop past the adolescent stage, and so is a boy in a man’s body. Together Tommy and Pappass do deliveries in the local area for Simone (Olga Sosnovska) and Sasha (Bernard Sheredy) who have a nearby butcher shop and delicatessen to pick up extra pocket money. 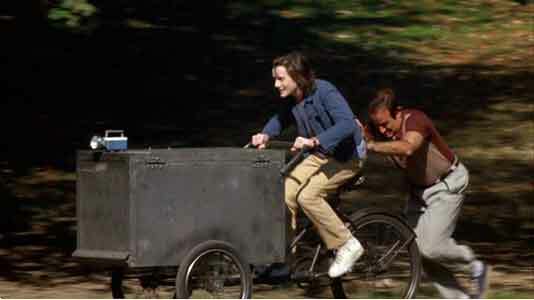 They drive around in a bicycle powered delivery cart and are saving up for a fancy green bicycle. They keep their tip money hidden in a strong box that they hide in a secret place near a women’s house of detention (the House of D). The women, who are incarcerated for non-violent crimes like prostitution, can shout out onto the street to talk to their pimps or anyone who will listen. Tommy strikes up a conversation one day with one of the inmates, known only to him as Lady (Erykah Badu). Soon she is giving Tommy advice about life and how to court a woman while unsuccessfully trying to get Tommy to bring her a bag of marijuana. Tommy’s best friend is Pappass, a mentally retarded man who is the janitor at his school. The life changing experience for Tommy comes as a result of three things coming together at once. First of all Tommy’s mother is very unstable mentally. She chain smokes cigarettes but worse yet takes barbiturates to deaden the pain of losing her husband which she still cannot deal with. Tommy is very worried about her and is constantly going into the medicine cabinet and counting how many pills are left. Sometimes he spends the night under her bed, drawing and ruminating about life, but also it is a way to keep an eye on her state of mind. They have a close but odd relationship. At times she just walks into the bathroom when Tommy is taking a shower and other times she really needs him as a companion, which is wonderful at times but grating to Tommy when he wants to be out of their flat doing things with his friends. Tommy is just beginning to discover girls, and has a crush on an attractive girl, Melissa (Zelda Williams—yes, Robin’s daughter) who reciprocates his affection. This new wrinkle in Tommy’s life causes Pappass to have a fit of jealousy because now Tommy is venturing into territory that he knows he can never go. Pappass brings things to a crisis point by smashing the window of the bicycle shop and stealing the green bicycle that he and Tommy were saving up for. Of course he is quickly caught and Father Duncan (Frank Langella) the principal of the school fires him from his janitorial job. Knowing that this is the only job Pappass can hang onto, Tommy jumps in and takes the blame for Pappass’ action. But it backfires on Tommy. He is expelled from the school, Melissa refuses to see him any more, and his mother overdoses on drugs and goes into a coma. In despair, Tommy runs to the House of D and asks Lady what he should do. Her advice: “Run! There is nothing keeping you here any more!” So Tommy runs and his destination is Paris. How he gets there and survives is an amusing coda to the flashback sequence. The balance of the film is about how Tom deals with what happened to him back in 1973. Tommy and Melissa are very attracted to each other. House of D is an movie of contrasting results. Emotionally it is satisfying and the characters do grab your attention and engage you in the story. Plotwise it is full of holes and inconsistencies that could ruin the impact of the movie if you think about them too much. The present day Warshaw family makes you wish you could know them personally, due to the pleasing personalities of Harold Cartier and Magali Amadei. You really wish that they had more screen time and that more Americans could see the French as they are presented in this film. Anton Yelchin’s performance as the young Tommy again proves that he is one of the most gifted of our young upcoming actors. Zelda Williams is charming as Tommy’s first love. You would like to see more of her and Yelchin together in this film. Téa Leoni and Erykah Badu are effective as the two very different mother figures in Tommy’s life. Throughout the various coming of age films that Yelchin has acted in, he has had these interesting relationships with his mothers and this film is no exception. The one role in this film that doesn’t ring true at times is Robin Williams as the mentally challenged Pappass. In the story, everything depends on you seeing Tommy’s friendship with Pappass being more important than everything else in his life: his education, his mom’s mental stability, and his new romance with Melissa. It’s not the acting, perhaps, but that his whole relationship with Tommy on reflection seems unrealistic and even a little strange. For a thirteen year old boy to be that understanding and forgiving when his whole world is crumbling around him is somewhat of a stretch. In the scenes when Pappass is being real annoying and crude when Melissa and Tommy are trying to talk to each other, most teens would tell Pappass to just buzz off! The second premise in the film that stretches your imagination is that the present day Tom could be married to someone, clearly in a loving and happy family, and not have ever told his wife anything about his past. Highly unlikely in the real world! The third area is the response of the Catholic School to the theft. You would think that given Pappass’ condition they would be a little more understanding about his actions, and that Father Duncan could have been clever enough to figure out why Tommy would choose to take the blame for Pappass’ crime when it was clear that he didn’t commit it. In the press kit, Duchovny says that he completed the entire screenplay in six days. Hopefully on future projects he will take a little more time for polishing and revisions. Concept-wise the film has some interesting ideas and is a faithful look back at the 1970s. When you watch the film, you do get caught up in its emotional and feel good flow. In the long run, that’s why you would want to see this film. 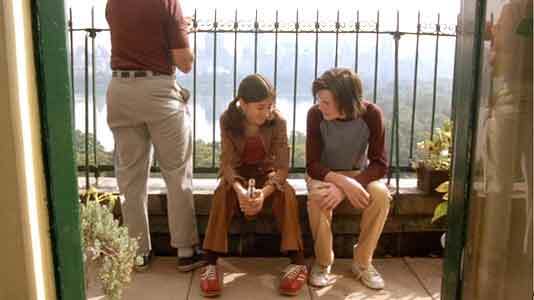 Tommy gets advice from a lady locked up in the House of D.
Anton Yelchin in his role as Tommy aged thirteen wears optical white high top chucks in most of the scenes he is in. House of D takes us back to 1973, and Tommy’s look is appropriate for the times. The best chuck scenes are when he is talking with his “Lady” at the House of D. There is a very cool dance sequence that Yelchin does with a telephone pole when Lady is encouraging him to go to the school dance and court Melissa for the first time. Tommy and Pappass store their valuables in a hidden sewer in front of the House of D.
House of D. (2004) Anton Yelchin, Robin Williams, Téa Leoni, Erykah Badu, David Duchovny, Frank Langella, Zelda Williams, Magali Amadei, Olga Sosnovska, Harold Cartier. Written and directed by David Duchovny. Categories: Drama, Coming of Age, Family.